Organisations are on an innovation treadmill that never stops. As the world has gone digital, customers’ expectations for new experiences, services and functionality have grown exponentially. The clearest examples of this are seen in the yearly smartphone cycles we are now so used to, or the app updates being pushed to our smartphones on a weekly, or even daily basis. The need to deliver the latest and greatest has become an enterprise-wide issue, with the likes of Amazon releasing new software every 11 seconds to retain its position as a digital leader. Mounting demands from consumers and market pressures from traditional and upcoming competitors means businesses are looking to digitally transform to create a competitive advantage. However, viewing digital transformation as the end goal can be dangerous for businesses, with Kodak and Blockbuster providing a cautionary tale of what can go wrong when companies take their foot off the pedal. As digital transformation projects reach what appears to be their final destination, organisations become more vulnerable to digitally-native competitors, who are constantly pushing the boundaries and looking at how they can further disrupt the market with something new. As a result, enterprises need to change the way they view transformation, treating it as a constant process instead of an end goal. Perpetual innovation can enable businesses to constantly adapt, evolve and drive forward change within their field and is the ideal state organisations should be striving to reach. To achieve perpetual innovation, businesses must first move beyond static infrastructure – which is why there’s been such a core focus on migrating to the cloud in recent years. Having a more dynamic, hybrid IT environment is crucial for driving continuous delivery of new products and services, as constant innovation requires a flexible and scalable IT ecosystem that can keep up with the pace of change. Cloud-native architectures built on microservices and containers foster faster development and deployment processes. This gives businesses the building blocks to enable perpetual innovation at the speed customers demand. However, the complexity introduced by hybrid cloud ecosystems can be problematic for IT teams, who don’t have the visibility to identify the root cause of performance problems impacting end users. 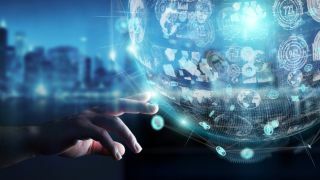 It’s impossible for humans to do this manually, so organisations will increasingly turn to AI to help IT teams identify problems, helping to prevent potential outages and mitigate the impact of performance problems on user experience. This helps organisations begin the journey to auto-remediation and, eventually, autonomous cloud operations – balancing the need to innovate quickly against maintaining user experience. But moving to the cloud is only half the battle – just because organisations have a more dynamic technology environment, it doesn’t mean they become agile overnight. Once organisations have full end-to-end visibility of their hybrid cloud environments, they must then look to change the mindset of IT teams, to create a more agile, dynamic culture. This shift in mindset can be achieved through the adoption of DevOps, which allows organisations to achieve a more agile, collaborative culture by breaking down the silos that development and operations teams work in. This creates an environment where each team works towards shared goals on specific applications and services instead of broad functions. For companies looking to achieve perpetual innovation, DevOps must become more than just a cultural norm for IT teams. Instead, it should be seen as a crucial component in how the business operates. A DevOps culture helps organisations to become more confident in their code, with different teams working together to ensure it works and optimises performance and customer experience. But to achieve this, DevOps teams need complete visibility into the impact of their code on performance. The collaborative culture means everyone has access to these insights, ensuring the whole team is working from a single source of business truth; one that is open and integrated into DevOps tool chains to drive improvements in the cycle of perpetual innovation. Organisations can take this further with BizDevOps, which makes perpetual innovation an enterprise issue by bringing employees from wider business siloes into DevOps teams. For example, customer success managers, digital marketing experts and customer service personnel can all become part of a BizDevOps team alongside IT specialists, responsible for a core application or microservice that powers customer engagement. This establishes a deeper, cross-organisational focus on innovation and ensures everyone is working together to improve the organisation’s ability to meet the needs of its customers. Injecting a more dynamic IT environment and agile ways of working into a business can help IT teams to find new ways of solving challenges, drive innovation and enhance customer experience. In an era of constant change, the need for perpetual innovation is greater than ever. Businesses looking to maintain a competitive edge and keep up with customer demands need to take a leap to ensure they stay competitive. The first step is migrating to the cloud to create a hybrid, dynamic environment that allows for rapid innovation. There must also be a change in mindset, combining new tools and systems with an entire overhaul of the way an organisation operates, creating an agile environment both technically and operationally. While this can be a huge adjustment and requires a constant turnover of new ideas, products and services, it is crucial to remaining competitive. But as they say, there’s no reward without risk.